Biodiesel marketing and the distribution of bio-based fuel products takes place on a vast, global scale. Every day, hundreds of thousands of companies and individuals buy these products at wholesale or directly from retail outlets that now number in the thousands. With a biodiesel supply network covering multiple U.S. states and a growing presence in Europe, the Targray Biofuels Division is well positioned to help biofuel manufacturers create a stable source of income from the sale of biodiesel. We create exclusive distribution agreements with biodiesel producers, matching their products with our customers across the United States and Europe. This enables our production partners to maximize their revenue potential while continuing to maintain a focus on their core competencies. Created and managed by the National Biodiesel Board, the BQ-9000 quality management certification is a cooperative and voluntary program for the accreditation of producers and marketers of biodiesel fuel. The importance of proper biodiesel handling and its impact on fuel quality is such that the biodiesel marketer certification carries important implications for the sale of biodiesel & biodiesel blends in the United States. 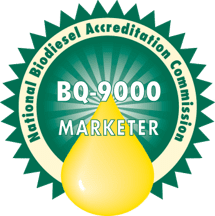 Targray has been a BQ-9000 certified biodiesel marketer since 2014.